Are you paying attention to where your time is spent? How does going less public and more private improve your business significantly? Learn from this episode of SuperFastBusiness. 00:31 – Do you know where you’re spending your time? Where is your attention focused? [Click To Tweet]. 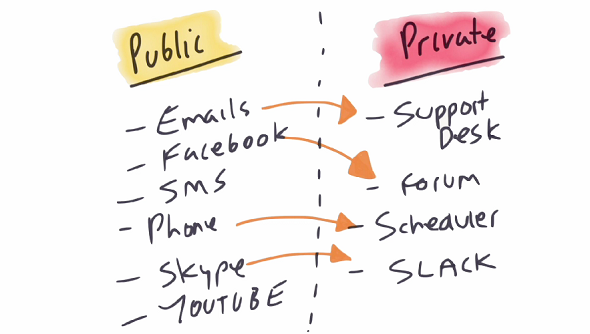 Go less public, more private. [Click To Tweet]. Next topic is Strategy and Mindset. Now this is one of my passion topics because of all the things that I talk about and implement, I’m constantly refining strategy and mindset. I’m thinking about business even if I’m floating around the Pacific Ocean on a piece of fiberglass. I love this stuff. I’m really interested in it. Today’s topic is: pay attention to where your time is spent. It’s absolutely critical and I want to show you a different way of doing things. The way that I’m doing things now compared to even a year ago or two years before and probably compared to just about everyone else is really giving me a payoff. The payoff is I make a lot more profit for every hour I work in my business and I’m working a lot less hours. And the reason I’m working a lot less hours is I’m really paying attention to where my time is spent. And a great tool, just while we’re here, and this isn’t even the tools section is, Rescue Time. The way that I use it is probably different to most. I’ve installed it on my computer. It emails me every Monday a weekly report. It’s free, and it tells me where I spent my time and how much time I spent. And I have a target goal. And I want to get under that goal. Typically, I would spend 9-10 hours a week in Gmail. I would spend 3 hours a week in my SilverCircle community, which usually shows up as Evernote. And I’d spend about 3 hours a week in SuperFastBusiness community, which shows up as SuperFastBusiness. That’s just to give you some benchmarks here. Facebook doesn’t even show. So I’m just going to show you what is happening. Your attention is being split between public things and private system. My business is my private system; it’s my ecosystem that I’ve created that is not publicly accessible unless they go through a pay wall or filters. And the public stuff is the stuff that is interrupting you and causing you to be less successful than you need to be. You probably have too much accessibility to public things, and in particular, things like notification messages; just destroying your attention and your ability to get stuff done. You are either receiving these notifications or sending them. And I think the ones who are sending them are making more money. So I’m going to just break it down for you in terms of a list of public versus private, and how you can divert your attention from one to the other. So let’s just have a look at this in more depth. The public type of things that are interfering with your capacity to create or to sell or to manage your existing customers are: number 1 is emails. I’m almost certain that email will be taking the most of your time, your active attention time. And number 2 for most people is just going to be your Facebook. If you have Facebook on your browser open all day, if you’re in there all day, like I see a lot of lifestyle gurus, people who talk about freedom and profit and all that; they seem to be on Facebook 24/7. And for me, that doesn’t seem consistent with the message. I have always advocated a hit and run philosophy with Facebook – get in and get out. It’s like a bank robbery. You’ve just got to get in, do the job and get out. I do use Facebook to sell. I go in there to answer questions in Facebook groups of other people’s, but I’m not putting my own Facebook group. Instead, I’m putting my own private forum. I want to spend my time in my own community. I want to spend time in a private community that is not feeding me dribble about what someone had for breakfast or their kid’s first words, or some video of a motorcycle accident. That is not going to help me grow my business, which is what I believe, the fundamental flaw of having your Facebook group, is you’re putting in the most busy, distracting engagement thief on the planet; don’t do it. Any time you spend in SuperFastBusiness is pure business time because it’s not distracting you, it’s absolutely purely focused on growing your business. That’s why I have a separate forum. In terms of emails coming into your inbox, the easiest solution is to create a support desk where you can handle customer support and you can hire someone to run it so it’s not you. If I would have answered my 500 support tickets, then I wouldn’t have time to do anything else. So I’ve hired people to help me with that. And that’s the greatest way to leverage your email, and of course, unsubscribe from all of the marketing emails. Just try and get that inbox down to the absolute minimum. Now you might be getting pestered with SMS and iMessage and Skype and telephone calls, and you might be cruising all around YouTube. Now the YouTube thing, it’s up to you to be disciplined with that. But I do have some solutions for the phone call. Don’t speak to people unless they’re about to buy something, and I’m going to show you that on another part of this session’s training; I’m going to show you some specific website technology to help you or some ideas around how to only be speaking to buyers, so stick around for that. The best way to only be speaking to the right people is to have a scheduling tool like ScheduleOnce or TimeTrade. Make people book in so that you’re only speaking to people at a time that you chose, on a topic you’ve pre-determined for a time limit that is specified in advance. That is the secret. That’s how I’ve been able to be more effective with my time. And switch off Skype and switch on Slack. I’m going to cover that in the software in more detail. But you want to get off Skype. Do you really need to know that 50 people had a birthday today? Because that thing is just so annoying. And as soon as you turn on Skype, that’s pretty much an invitation for free business coaching. People who are too unfocused in their life are going to be wanting to see if they can unfocus you as well. So if you go down the left-hand column and you can just turn everything off and you can only have the right-hand column, then you’re going to have a significantly better, effective business. Less public, more private. That’s my action item for you. It’s amazing what you learn when you sit down and really quantify where we focus our efforts. James, you surf and watch movies as your ‘outlet’, your opportunity to disconnect and recharge, what would you suggest to someone who doesn’t have a hobby but uses Facebook to ‘escape’ for a while? Ideally you will find a recharge source that does not require you to be switched ‘on’ . In the past I have enjoyed playstation, gym, mountain biking, walking, swimming and reading. A good massage will often help. Thanks James. The Rescue Time tip is helpful. Oh and the FB one too! Hi Zed, it is a big topic. There may be some groups where facebook makes sense. Perhaps low tech niche where users have limited computer skills or hobbyist markets where time on Facebook is not at the expense of business attention. (Pets, golf, sports etc..). I know people who have 10,000 person groups on Facebook that go quiet and die. Keeping a private forum takes strategy (I teach it in my own forums). Engagement is not the primary goal, retention is the goal. (Get this through results). Very powerful information, compact delivery. Awesome. Thanks, James. I just set up Rescue Time and set a productivity goal in it. Now, back to work. James, do you track your work time in other apps? Or Rescue Time is the only one place for tracking your business time? Just rescue time for the desktop. I limit my device time.